“Kids often go without enough to eat because the rent eats first,” said Dr. Matthew Desmond at a briefing on Capitol Hill earlier this week. 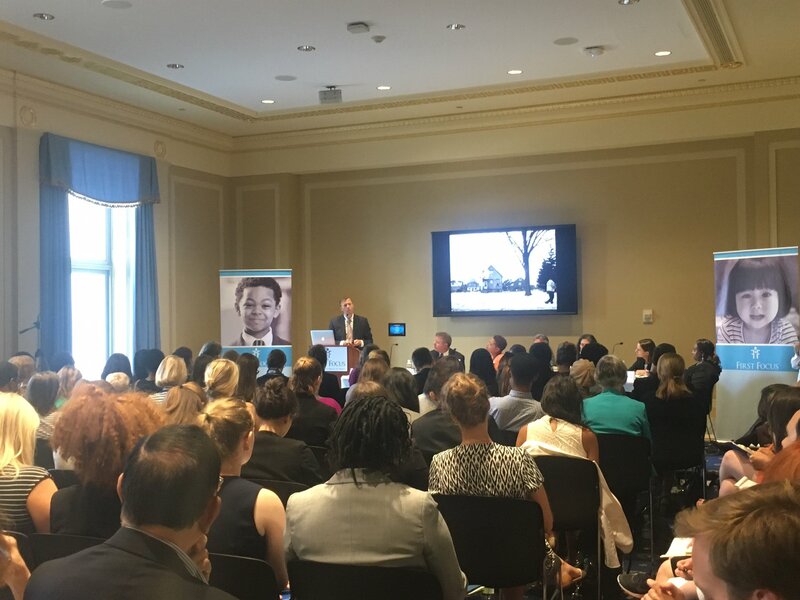 On Wednesday, July 19th, First Focus with honorary co-host Congressman Keith Ellison (D-MN) hosted sociologist and Pulitzer Prize-winning author of Evicted, Dr. Matthew Desmond for a Congressional briefing entitled Children and Families Facing Eviction. The briefing focused on the experience of families facing evictions in the U.S. and the negative implications of housing instability and homelessness for children and families. Policies must address why families are evicted as well as the instability that eviction brings. First Focus’ President Bruce Lesley opened to a packed room and provided context for the discussion with the statistics that 1 in 5 kids live in poverty in the U.S., and kids are 69% more likely to live in poverty than adults. Still, Congress invests less than 8% of all federal spending in kids. He was followed by Rep. Keith Ellison, a champion for children and an advocate for affordable housing. Ellison noted that families should not have to choose between safe housing and affordable housing. He recently introduced H.R. 1146 to provide civil legal services to families facing eviction in an effort to reduce rates of family homelessness. First Focus Campaign for Children has endorsed this legislation. Desmond’s studies and personal encounters highlighted an important takeaway that children and families are disproportionately impacted by eviction. A household’s chances of being evicted triples when there are children involved. Instead of evoking sympathy in landlords, children are seen as liabilities for nothing more than being children. This cross-sector panel discussed the issue of kids’ outcomes as they relate to the intersection of housing, health, education, and legal services. Dr. Amy Schwartz stated, “Kids who experience foreclosure-related moves see a significant decrease in academic performance. Evidence shows that housing vouchers provide stability and improve educational outcomes. Dr. Brittany Lewis gave insight to the importance of data collection for understanding “how” and “why” evictions take place. Dr. Rutheiser underscored the need for philanthropists to be strategic and creative in putting this research into action. Beth Harrison advocated that access to legal services is needed to assist families in preventing evictions. Tenants who have representation are 7 times less likely to face the start of an eviction. Alicia Smith spoke graciously about how her community has embraced her daughter with special needs and the impact that legal services has had in keeping her daughter in a stable, familiar environment. The panelists illustrated that this issue sits at the nexus of everyone’s responsibility and no one’s responsibility. In taking a cross-sector approach to the housing crisis, it is important that interventions to support children and families who have been evicted acknowledge all barriers to stability, and address both the reasons why the family was evicted as well as the trauma experienced as a result of the eviction. Increasing access to affordable housing and legal services are critical, but there is also a need for continued support for programs that assist children and families who experience high rates of mobility. At the briefing, First Focus Campaign for Children released 11 policy recommendations to support children and families facing eviction and boost housing stability. These recommendations include passing the Homeless Children and Youth Act (S.611/H.R.1511), increasing household access to early childhood programs strengthening and protecting vital programs such as Medicaid, the Children’s Health Insurance Program (CHIP), and the Temporary Assistance for Needy Families (TANF). We thank Dr. Matthew Desmond, Congressman Keith Ellison and the panelists for their dedication and commitment to children and families and for participating in the briefing. First Focus Campaign for Children will continue working to advance federal policies that promote the well-being of low-income children and families who face high rates of mobility and unstable living environments. To view presentations and materials from the briefing click here. To view First Focus’ Executive Summary click here and Policy Recommendations click here.